After a visit to the Chinese Pavilion, we sailed over to the Pavillon canadien-français which, we learned, has its own connections to China! Read on to find out more. *This pavilion does have an ATM machine on site but also accepts credit cards for food purchases! I attended this pavilion last year and loved that they incorporate theatre and storytelling into their performances. It makes for a very creative and refreshing twist to what I’ve come to expect from Folklorama entertainment. You step back into time when you visit this cultural display. There is a photo booth where you can wear coats from the Hudson’s Bay Company, toques, and hold snowshoes. Volunteers also take the photo for you and help you with the accessories. Nice touch! 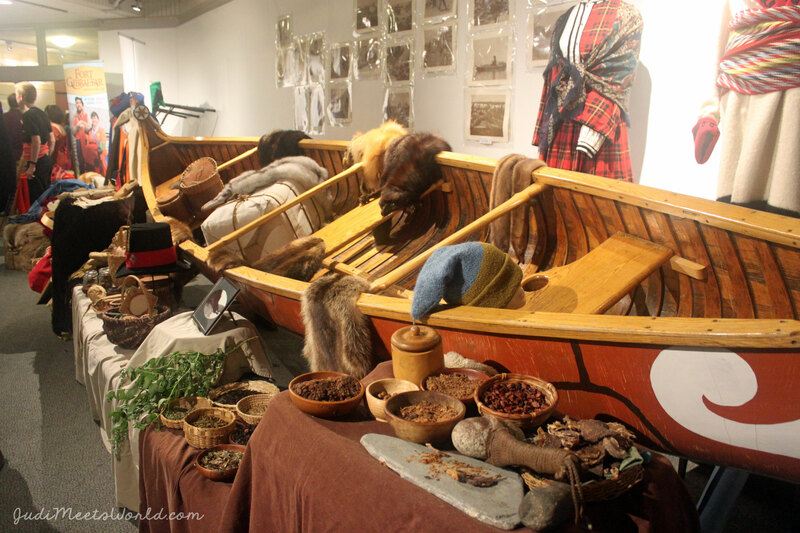 Walking onward, there is a demonstration of weaving of the famous sashes, and a canoe with all the things necessary for long voyages. 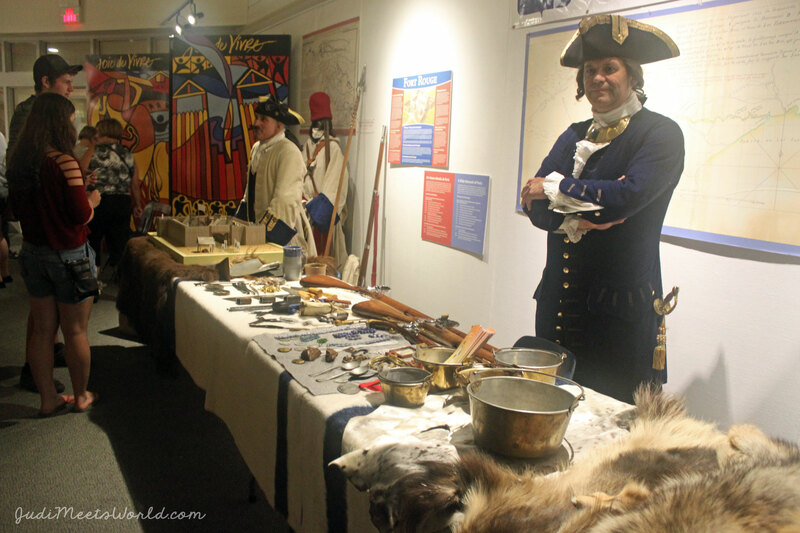 A little further, you can have a conversation about trading with the captain, all dressed up of course, behind the model of Fort Rouge. He actually described about looking for a passage to China to access furs and thus, stopping in Canada. While you wait, there is live entertainment and sugar pie/maple fudge samples by sponsor Stella’s Bakery. Beside the cultural display is a fairly large market area to take home souvenirs. Maple syrup? Fudge? Sashes? Toques? If it’s canadien-français, you will certainly find it here. They have a fine range of savoury and sweet items. We opted for pea soup, bison meatballs, and classic sugar pie. This sugar pie was not only delicious, but it had a melt-in-your-mouth quality! I must apologize for the lack of a photo of the food – we had gone ahead and eaten it up! 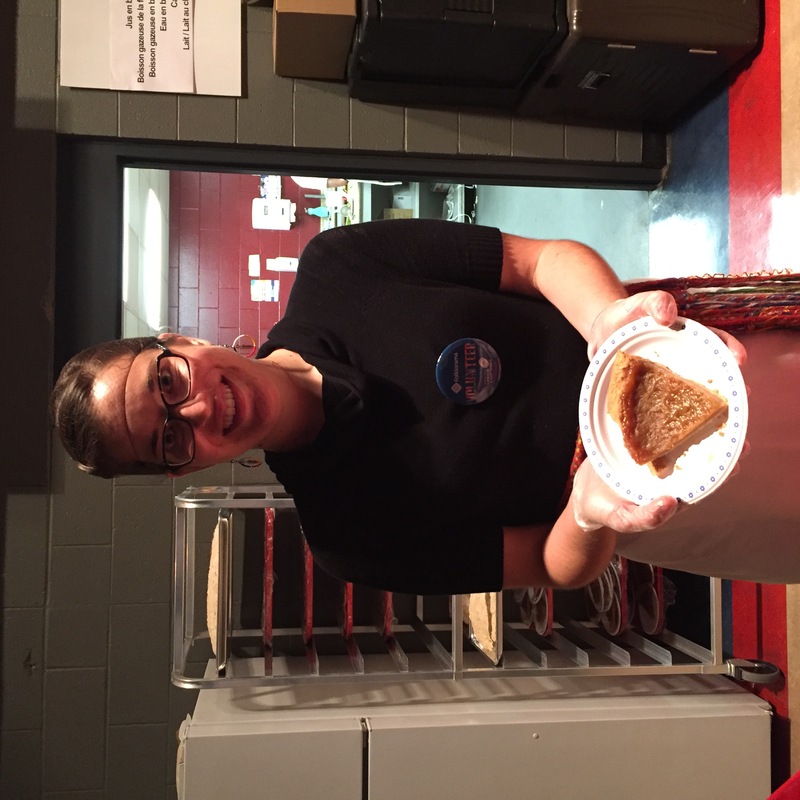 * A big thank you to Jonas, the social media coordinator for the pavilion for providing the photo of their volunteer, Rachelle, with a slice of the famous sugar pie! As mentioned above, the storytelling and theatre of La Troupe Jeunesse de l’EFRR makes for a very entertaining twist. This year, they take you onboard a train that takes us coast to coast. If you want to sing along, there are also lyrics on screen behind the performers – with an English translation. On the way, we learn about the different canadien-français communities through their legends – acted out, of course, by our talented actors! Everyone at La Pavillon canadien-français have no problem getting into their characters. Between the cultural display, to the bands, to the stage – everyone has a role to play! This pavilion has a live band that plays throughout the entire story. Not only do these young musicians play for the dancers, they also become a musical act between dances as well. Hats off to this hardworking, talented band! Thank you for having us at La Pavillon canadien-français! Heho!